Today's Draw: Ten of Energy from the Snowland Tarot. How long has it been since you've just wallowed in peace? Do you find yourself putting things between you and peace? With all the stuff you manage during a typical day, do you ever stop and examine what and whom you're serving? 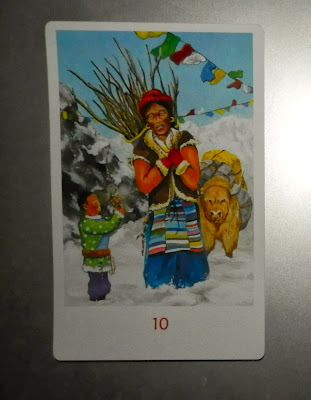 Today's card shows a woman weighed down by the sticks on her back as she's guiding a yak even more loaded down. We've talked before about learning to say no to others when you already have enough going on. We've talked about being careful of the people who drain energy in your life. And we've talked about re-assessing what really needs to be accomplished now—or ever—to ease your burden. All of those things are what this card is about. Looking at all the prayer flags and the boy spinning the prayer wheel, however, it makes me think of how we can sometimes overburden ourselves on our spiritual and personal journeys, too. Maybe we put too much pressure on ourselves to learn and grow. Maybe we beat ourselves up for backsliding. Or adopt too many regular practices. Or try too hard to believe something we don't. Or are pushing too hard against some inevitability along our path. Or maybe we've even just gone through a growth spurt and are feeling a bit overwhelmed. It's easy to see when a friend or acquaintance is sucking you dry, but sometimes harder to see where we're sucking ourselves dry. It may not even occur to us to look to ourselves as the cause of our spiritual or psychic exhaustion. Whatever the reason, it might be time to just stop and take a rest. The woman in this card is in a place of peace. She's in an area surrounded by prayer flags. She has prayer beads at her hip. And the child seems to be offering her his prayer wheel. Despite all of that, though, she is not at peace. She has "miles to go before she sleeps." Or prays. Or finds relief. She is so focused on doing the work that she puts off feeling the peace. She puts off contentment to suffer a while longer. Does this sound familiar at all to you? I often find myself putting off meditation or deep thought or even being in the moment in favor of what's in front of me. I tell myself I'll never be able to concentrate if the floor isn't vacuumed. Or that I'll work more on my daily meditation practice after I reach this or that spiritual goal. I try to catch sunsets when they happen, but often I'll make a bunch of random rules...I have to do X, Y and Z before I can sit on the porch. Sometimes this means I miss the sunset. And the peace. In essence, I'm choosing the noise and toil over peace, based on a bunch of random rules and considerations that really mean nothing. What about you? Do you find yourself putting others and/or the pursuit of your own stuff between you and peace? And how important is personal peace to you? If it's the most important thing, why aren't you treating it that way? Ellen, I have an abundance altar that has become over abundant, too. :) I'm going to work on it this weekend.